Tonight was a BIG WIN for sanity… the people in MS voted down the amendment which would have made fertilized eggs people and taken away women’s hard won choices and rights. And in Ohio, the people voted against the extremists / Koch brothers who tried to take away collective bargaining/workers rights. 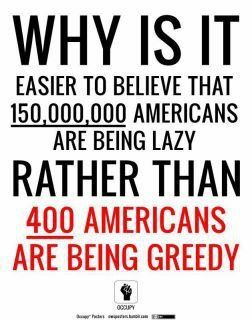 And 50 million seniors who vote are against cuts to Social Security and Medicare according to AARP. So of course, this all led to another stupid disagreement with one of my roommates who is a raving, brainwashed bible thumper who continually asserts his right to tell everyone else what to do, who hates everyone else’s ideas (gay people, women, liberals, non-Christians, etc), and his extremist Faux news regurgitation about hating the Occupy Wall Street protesters… (meanwhile, he’s the biggest freeloader I’ve EVER met, is on disability and refuses to pay his fair share, somehow that all works together… corporations freeload with not paying taxes and getting billions in corporate welfare) he was quoting one of his church buddies about how the Occupation is really all about the sin of envy… which is NOT at all what the Occupation is about. I told him to go spend 20 minutes with the local Occupiers and LISTEN to them talk and then come back and talk to me. Well, of course he won’t do that. He does NOT want to hear/listen to anyone who does not agree with him. He has too many preconceived notions to confront if he did listen and hear. And he’d have to OPEN UP his mind a tiny bit to other people and to Truth/Reality. He is living in a fantasy world and wants to live in the Dark Ages. Does anyone have a time travel machine? I’d be happy to send him (and the rest of them) back there. Also, ironic and contradictory is how the GOP right wing extremists say they want small government yet they want BIG government to GOVERN gay people (marriage), women’s wombs, workers, and intrude in our lives in all sorts of disturbing ways. They campaign saying that they want Jobs for Americans and all they do is try to overturn gay marriage, worker’s rights and women’s choices. It made me think of how when I was 19 years old, I was engaged to be married to a guy who’s family had money. They belonged to a country club. And everything that they did was about appearance. I abhorred not their money but what they did with the money, how they used it to lord it over others. I was not impressed and did not appreciate their lack of kindness, compassion and the spiritual/emotional vacuum of their lives. They were cruel people. And had no regard for anyone else. I was a sort of closet hippie and threw the baby (money) out with the bath water. I blamed money for their lack of honesty and their meanness. But it was not the money, it was the people’s lack of humanity. The money was just the currency by which they expressed their hatred of the world and tried to prove their superiority to everyone else. A very sad and unsatisfactory state of affairs. During the 80’s, I traveled around the world for three years to numerous countries, with an interfaith, international, interdenominational prayer ministry. We prayed for other people and visited many churches of different faiths. We did not tell anyone else what to do or believe. We were not there to save anyone, although many of us had accepted Jesus. We were not about the right way to be Christian. And we saw a lot of hypocrisy in the various churches. A lot of reverends, priests and preachers telling others what to do, how to think and meanwhile they did not often practice what they preached in their own lives. 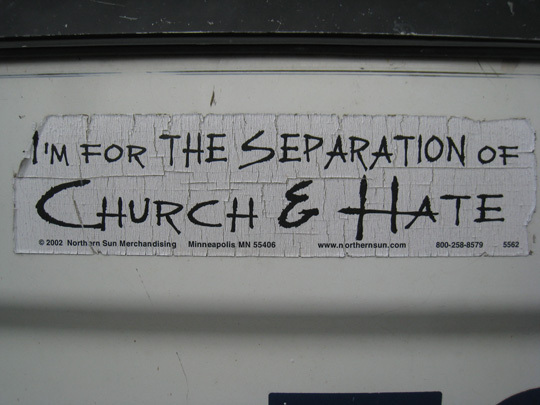 One of the local people carried this sign and posted it and I agree… I support the separation of Church and Hate… because nowadays there is much too much hate taught in the churches. And the good Christian flock/followers, like good Germans, go along with their leaders. But they are being used by people in power with no morals, no ethics, as tools in their extreme lust of power and greed. So I say unto the Kingdom of God, cast out these thieves from amongst you. Open up your eyes and stop being sheep. For surely, you are and will be slaughtered. They are teaching you false doctrines in order to enslave you. Jesus came to set people FREE and empower not enslave. He said know them by their fruits… of kindness, love, and patience. He threw OUT the moneychangers at the temple. He had contempt for the Pharisees and Sadducees. Nowadays, he’d do the same with the false prophets from hell… the extremists who want you to goosestep to their tunes. Think for yourselves. Turn off Faux News, question your pastors, and read/listen and educate yourselves. And dare I say it, visit your local Occupation and talk to the people. Find out for YOURSELVES what it’s all about. You might be surprised to learn that the Occupation is NOT about evil doers, sinners and (gasp) all a bunch of liberals/Democrats, Socialists.